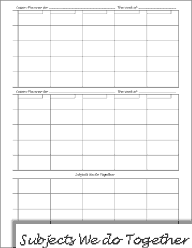 This web page has a selection of some of my weekly homeschool lesson planner forms. 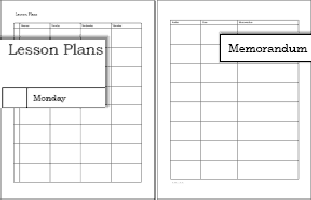 Be sure to view the Homeschool Planner Sets to see more planner options. Also see my aritcle on How to Make a Homeschool Weekly Planner Book. Some of the forms have examples so you can see how one might use them. The PDF versions are meant to be filled out by hand. 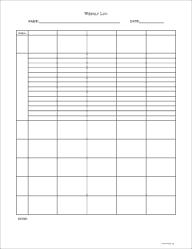 Most, but not all, of the forms on this page are included in DOC or RTF format in the word zipped package download. It is important to note that donnayoung.org has more weekly planner files than the ones listed below. See also Coordinated Sets and Column Planners. 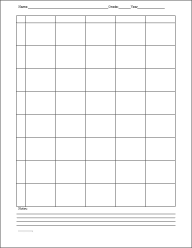 Weekly Planner 5x8 This is the basic weekly home school planner which has 5 columns and 8 rows. The header space has a place to write the child's name, grade and year. 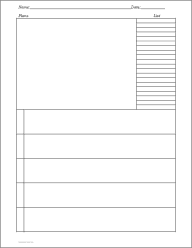 Weekly "Class" Type-able PDF: This form is very similar to the one above except it is type-able. Caution: Adobe Reader will not save what you type. This form must be filled out and then printed. This ruled weekly planner has 5 columns 8 rows and check-off bubbles. A typeable version - This file will probably not save what you type. To Use: Type in the fields and Print. The "Margins" planner contains open sided boxes in the margin areas. The left margin is labeled Classes. The right margin is unlabeled. Two-page planners are the roomiest weekly planners. I used them for both of my children when they were in the elementary years. 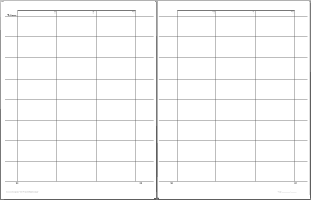 This planner requires two sheets of paper to print. One side has 4 columns and 8 rows.. presumably for Monday through Thursday. The second page has 3 columns and 8 rows. One column for Friday, one columns for lists, and one wide column for anything you feel like using it for. The planner is completely not ruled and simply has the header, Lesson Plans. 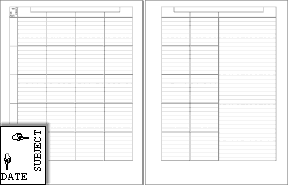 Ruled 2-Page Planner (Days Unlabeled) Another 2-page planner, this one has 5 rows and 6 columns plus one wide column. The "Margins" planner contains open sided boxes in the margin areas. In the 2-page version of Margins, the inner margins and right margin on page two are unlabeled. The left outer margin on page one is labeled classes. The lesson plan columns are labeled with Roman numbers. The 6th column may be used for a 6th day or for lists. See the two page planners if the one page planners listed below do not have enough room. 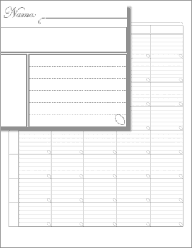 Putting Together a Weekly Homeschool Planner?